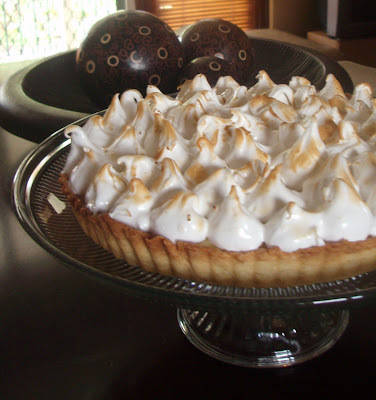 Well what better way to begin my food blog then with a creative twist of one of my family's favourite desserts.....lemon meringue pie. I was sorting through my, continually expanding, food magazine collection, when I came across the March 07 Gourmet Traveller (GT). I had always adored the lemon meringue pie on the cover and remember thinking I wanted to make it one day. Yet, like most of us, I never quite got around to it.....until today. The filling is also different this one’s made using a combination of the traditional cornflour thickened lemon custard and a lemon curd. Which I truly adore as it gives a richer, tart and more delectable citrus filling, though it is a little softer than the traditional filling. Of course I added my own twists to the GT recipe. I only had 2 lemons (the original recipe needed 3) however I had a lime and some passionfruit in the fridge which would make a beautiful addition as citrus and passionfruit are a match made in heaven! I also made a richer sweet shortcrust pastry by upping the flour and adding an egg yolk. Not only because it gives a much shorter pastry but also to use the spare egg yolk. The meringue needed 4 egg whites yet the filling only used 3 egg yolks. I don’t know about you, but I hate it when a recipe leaves you with a spare egg yolk that you have to ‘save & store’. How many times have you saved that left over egg yolk, placing it in a cup or bowl, covering with plastic wrap and placing it in the fridge with the thought "I’ll use it to add extra richness to scrambled eggs or an omelette or make mayonnaise"…. only to find that shrivelled, putrid egg yolk pushed down the back of the fridge weeks later! So off I went creating. Italian meringue is certainly a new technique for me, have made meringue many times but this method which reguires you to 'boil sugar and water'. When reading the recipe it said to “heat until temperature reaches 115ºC on a sugar thermometer", which I don’t have, so using a little culinary judgement I boiled it to a firm ball stage, which worked. However a sugar thermomemter isn't that the only thing I don't have in my little kitchen. Although I own a blow torch so I could ‘caramelise’ the meringue funnily I don’t have a piping bag to pipe it! Improvisation again took hold....it's amazing what you can achieve with two teaspoons….although not as delicate as the GT cover it still achieves that ‘wow’ factor. I hope you get as much pleasure with this weekend lunch treat as my family, and our Japanese & Thai homestay students, did. To make pastry: Place flour and butter into a food processor and pulse until the mixture resembles breadcrumbs. Remember not to overwork the pastry as the heat from the processor can overheat the butter. Add sugar, egg yolk and vanilla n process until the mixture comes together. You may need to add 1 - 2 tbsp water to help this combine.Turn dough onto a lightly floured board and knead lightly to form into a ball. Wrap in plastic wrap and chill, in the refrigerator, for 20 minutes. Preheat oven to 190ºC. Roll out dough onto a lightly floured board so it fits a 23cm flan tin (with a removable base). Using a rolling pin carefully lift off pastry and transfer into the tin. You need to be careful as the mixture is a little softer than normal pastry. Press pastry firmly into pan, being careful not to stretch the pasty, otherwise it will shrink when baked. Trim excess and lightly prick the base with a fork. Line with greaseproof or nonstick baking paper and fill with dried beans or uncooked rice. Blind bake for 20 minutes. Remove paper and beans* then bake for a for a further 5-10 minutes until golden. Let cool in pan. To make filling: Combine lemon juice and rind in a heatproof bowl, then place over a saucepan of simmering water. In another bowl combine cornflour and water, then pour into lemon mixture and whisk until combined.. Add boiling water and whisk over simmer water until thick. Remove from heat. Whisk in egg yolks, sugar and butter until combined. Let cool, then place into the refrigerator until cold. Spoon mixture into the cooled pastry case and smooth the top. To make meringue: Place sugar in a heavy based saucepan, add water and stir over low heat until sugar dissolves. Turn heat to high and cook until it reaches the firmball stage (drop a little syrup into a glass of cold water and it should form a firm ball), then remove from heat. Using an electric mixer, beat egg whites to soft peak stage. Then, with the motor still running, slowly add the sugar syrup and whisk for 5 minutes until becomes thick and glossy, then continue to beat on low speed for another 2 -3 minutes or until ready to use. Form teaspoonfuls of meringue into 2 -3 cm peaks (GT said to do this with a piping bag with a 2cm plain nozzle but when you don’t have one teaspoons work just as well but need a little more care). Using a blowtorch, or a hot grill, toast meringue until top is evenly golden. Oh yeah, I so know that putrid left over egg yolk or white routine - LOL! I find magazine recipes that ask for special equipment like thermometers really annoying. After listening to the Vogue Entertaining Editor speak at 'Out of the Frying Pan' I realised that kind of detail shows a lack of understanding about their average reader's kitchens and their culinary skills. Welcome to the blogosphere foodnutzz - I look forward to reading your future posts.